I am taking some inspiration for this project from one of Lisa Baldini’s (my collaborator for Contemplative Computing) early experiments in the MAIM minor project module. In a nutshell she was attempting to use the growth of bacteria as a variable factor to modulate the intentionality of the human voice. This idea really resonated with me and I want to develop it in my own way with regards to the bacteria and consciousness conundrum which I rambled about here. I hope that the experiments I do can help plug into Lisa’s work and move her project forward as well as letting me scratch this itch that’s been growing ever since I read about bacteria data storage. Here’s how I envision the project developing, in roughly three phases, each developing in complexity. Keeping in line with what I’ve learned under Harwood I expect each stage to be contingent upon the next. 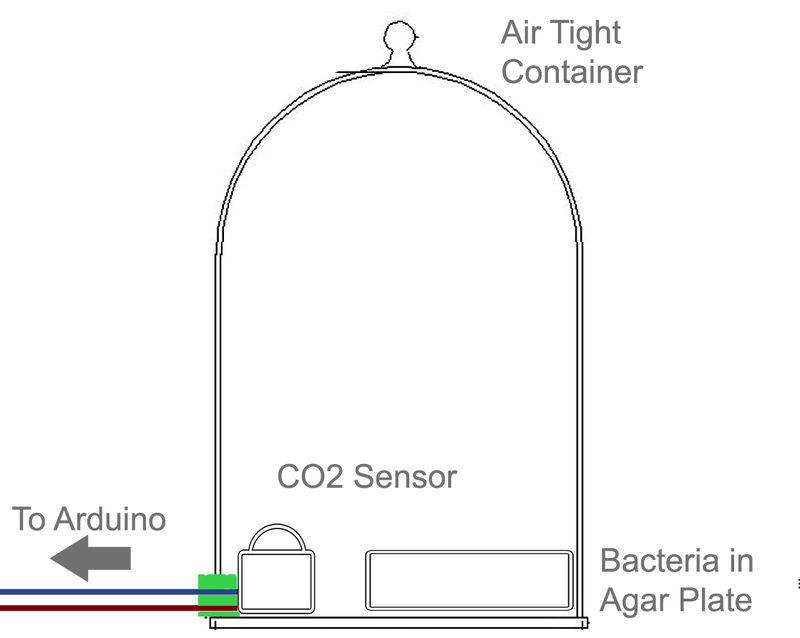 I haven’t decided on which sensor to buy yet, though I’m leaning towards CO2 sensors and working with anaerobic bacteria as the test subject. Basically I will culture the bacteria in as airtight an environment as possible. The eventual aim, once proof of concept is established, will be to fix the sensors into a resin cap to place over the agar guaranteeing as little gas contamination as possible. Such precise metrics are not my immediate concern. I have a few ideas of how to measure the Co2 from the bacteria (as crudely sketched below) but as I know too well these methods will have to adapt on the fly. I’m going to feed the CO2 values into an arduino and use these values as a means of determining the rate of increase/growth in the bacteria culture. I do not know if the amount of CO2 produced will prove to be an accurate gauge of their growth but I suppose I will find out via the process. If I manage to get some level of usable data from the above experiment I will do the following with it. This method is again a proof of concept and I’m leaning towards using Enigma encryption as an attempt to make some conceptual link back to Turing. If it proves too difficult to code then I’ll find some easier way to scramble the message. This second stage will be proof of concept for the software filter that the bacteria data will plug into, and if I have time (which is admittedly unlikely) I may do it concurrently with the bacteria experiments. This is where I will aim to make the conceptual bridge between what inspired me to undertake this project and the steps taken to get there. As mentioned the program will search for a hashtag and scramble it. The eventual realisation for this project will be that rather than wholesale scrambling it the software filter will change the content and context (i.e. intention) of the message. What I am attempting here will be very crude semantic AI so plenty of pitfalls undoubtedly await. The last place I hope to take the project would be to make it into a participative game, although this last element is immensely contingent upon all the above parts moving in coordinated synchrony. For instance if the same message is posted by ten people, e.g. “what hath god wrought #bacteriamind” then rather than trigger a semantic scrambling of the message a toxic substance will be released into the agar, killing off some of the bacteria, or at least lessening their number. This is to finally link back to the idea of bacteria outnumbering us ten to one, but if our sentiment can be collectively articulated on Twitter maybe this extended consciousness can overcome our bacteria scrambled embodied intent? Man, I want back in this project.